If you are a regular TNT-Audio reader, you will surely have noticed during our recent Aliante Factory Tour article, the advanced prototype of an active subwoofer named "PF 1000". This is a real first for this Revello (CN)-based company, in fact it's the first object of this kind to see the light in Aliante's facilities. But hey, wait a minute! How come a company traditionally devoted to the (sane) principles of good musical reproduction, suddenly starts selling something that many consider damaging to the acoustics of room performance, or at least in the most restrictive sense of Hi-Fi? On those very same pages, I expressed my point of view about it. This kind of stuff has become substantially better than a year ago. Now placing an active subwoofer into a Hi-Fi system is not a heresy anymore (providing it's well engineered and sports the controls needed to adjust it, allowing you to fine tune the entire system). Really not much to say about it. It's the classic black cube, partly slimmed by it's rounded front panel and its vaguely oval protection grille. The cabinet surface is soft and textured, almost artificial leather-like. The PF 1000 sports a 10" (25cm.) woofer with a 40mm moving coil and a lightweight compound basket. It is reflex-loaded and driven by an internal 1000W RMS power amp. The frequency response given is 30Hz to 120Hz (+/- 3dB). It's inputs accept either a line level signal from your preamp or a high level signal from the speaker terminals of your power amp. The upper crossover frequency is adjustable from 40Hz to 120Hz. Additionally, there is an output level control, the automatic on/off switching selector, a button to select phase (0 or 180 degrees), and obviously the power switch. There's also a speaker output with a passive high-pass filter tuned to 100Hz (for 8-ohm satellites). The unit comes with rubber feet for isolation. At 44 x 48 x 44 (width x height x depth), it's pretty big. Even its 30kg-weight is impressive. You expect a (properly designed) subwoofer to give substantial support to the low range without drawing attention to itself. What's really difficult is to reach this without sloppy, uncontrolled bass and big in-room acoustic tails that are so unrealistic that you can't bare to listen. Even more difficult is to obtain an acceptable dynamic coherence with your loudspeakers. Ultimately, the goal is to achieve a completely homogeneous sound, so that the subwoofer becomes an ideal and synergistic extension of the loudspeakers to which it is coupled. For the PF 1000 test, I could count on the "cooperation" of a pair of Aliante loudspeakers. They were the "Punto 5's". They are a two-way, bass-reflex loaded mini-monitor of quality design. They use an Aliante-engineered aluminum tweeter and an 11cm (little) polypropylene woofer. I figured these would be adequate to match the subwoofer for this listening test. The fine tuning operation took a couple of days. After alot of adjustment, I arrived at a setting I thought was best based on the system and listening room. The crossover frequency was around 60Hz, phase at 180 degrees, and volume near half-way. With these settings, I achieved a fast and transparent bass that didn't destroy the loudspeakers' clarity yet allowed them to articulate their own low range. This was mainly due to the 60Hz crossover frequency. The phase setting of 180 degrees, substantially helped to get rid of in-room sound tails. The 0 degree setting made the subwoofer stand out (at least in my listening room). For this test, the loudspeakers were placed far from the rear wall, at about 1.8 meters, while the subwoofer was at about 30 cm. Tweaking the volume control led to a good dynamic coherence with the Punto 5's. BTW, the PF 1000's controls are really very accurate. It's possible to operate with micro-metric precision! After fine tuning the sub, I found myself able to enjoy music for several days without having to (continuously) leave my chair to somehow change sub's settings (which is what I did the first two days :-| ). I finally got a taste of the physically engaging bass. Finally, justice was given to the Reference Recording edition of Berlioz's Simphonie Fantasque and it's pipe organ. The wonderful Proprius recording of Cantate Domino's cello was simply majestic. Don't misunderstand, the mini-monitors held their own and showed plenty of finesse in their own frequency range. I experienced some minor hum problems caused by the grounding loop. The substitution of the original mains cord with a non-grounded one solved it. The subwoofer sent me to for this test was a pre-series sample. Mr.Prato assured me that the internal grounding problem will be corrected in the final model that goes to market. Place it on conical spikes. You will hear great gains in articulation and transparency. Use it to compliment the low range of your speakers (avoiding it's 100 Hz filtered outputs). To get the best results, start with the lowest (volume) setting and adjust the controls little by little. Your ears (and your nervous system...) will thank you. 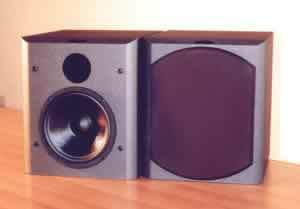 The PF 1000 was concieved for home theatre use (but not soley). This listening test demonstrated that it performed well in a pure Hi-Fi context. Of course, there's no point in matching it to loudspeakers that have an adequately extended low range. The fistful of hertz gained wouldn't justify the possible low range interaction between the subwoofer and the loudspeakers. The best use of the PF 1000 is to couple it with mini-monitors whose in-room frequency response doesn't get below about 60Hz. Don't think if you match it with a "little" loudspeaker you will achieve the sound typical of a "great" loudspeaker. What you get, will always be the sound of a "little" loudspeaker with a sub. It cannot be denied that the low range sustain given by this subwoofer can help to reach that immanence, that physical and emotional rapture naturally forbidden to those of us who listen via mini-monitors. In other words, do you enjoy the sound of your fine minis and have no intention of changing them to a different model, yet sometimes find yourself suffering their low-end limitations? A heart felt thank you to Mr.Giuseppe Prato, from Aliante, for having sent us the PF 1000 subwoofer for this listening test.